Includes everything you need to make a mold of a hand, etc. Step-by-step instructions will guide you through the process. Comes with: 1 lb. Alja-Safe Molding Gel, 2 lbs. 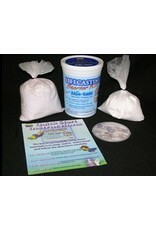 Casting Plaster, How-To DVD, Quick Start Guide. 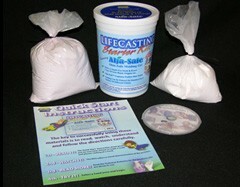 Alja-Safe is a new addition to the Smooth-On family of "Life Casting" mold making materials. Alja-Safe alginate is suitable for making "temporary" molds of the face, hands and other body parts. (For making re-usable molds of any body part, use "Body Double" silicone rubber. )What's Sets Alja-Safe Apart? In addition to being an exceptional skin safe body molding material, Alja-Safe alginate does not contain free crystalline silica (a known carcinogen). Alja-Safe also captures detail better than other alginates, giving you a more accurate reproduction of your original. Alja-Safe is easy to use and cures quickly. It reproduces fine detail and makes and excellent temporary mold - good for one or two reproductions of any body part. You can then cast plaster, Matrix NEO (polymer modified gypsum) or Smooth-Cast 300Q fast urethane resin into the mold to make a reproduction. NOTE - ALL SPECIFICATIONS OBTAINED USING 80F / 23C WATER Working time and demold time can be reduced by using warmer water. Cooler water will give a longer working time and extend the demold time. A:B Mix Ratio: 1 Water: 1 Alja-Safe Powder By Volume. Demold Time: 10 mins., Pot Life: 8 mins.